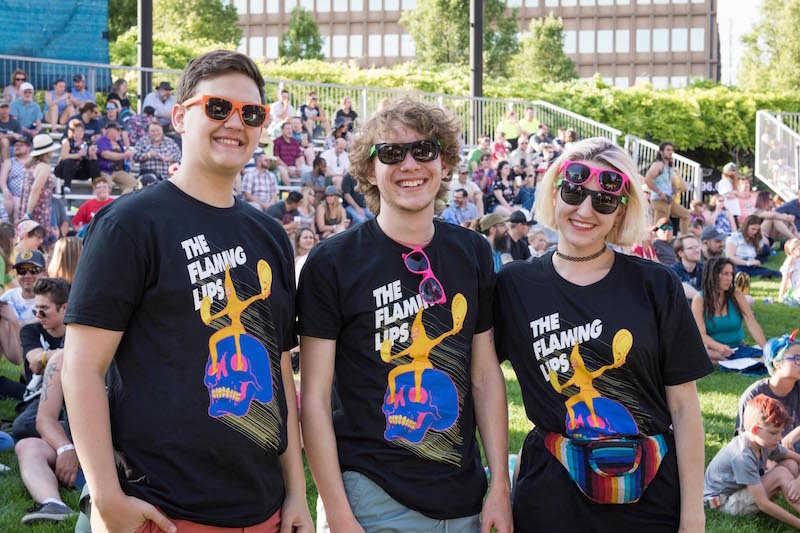 Turning down Historic 25th Street, people were filling the sidewalks on their way to the Ogden Amphitheater for the opening show of the Ogden Twilight Concert Series. 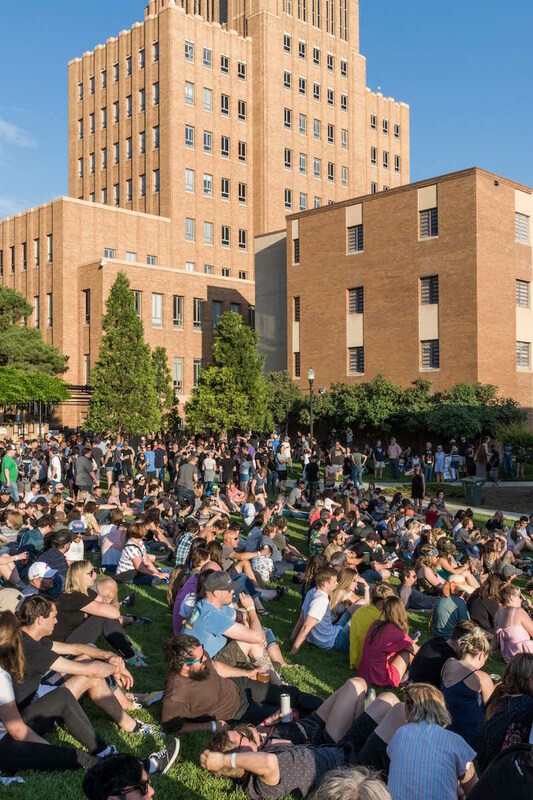 The hot afternoon sun beat down from the perfectly clear, blue skies over individuals flocking the area, having traveled from all directions to join together for this event. 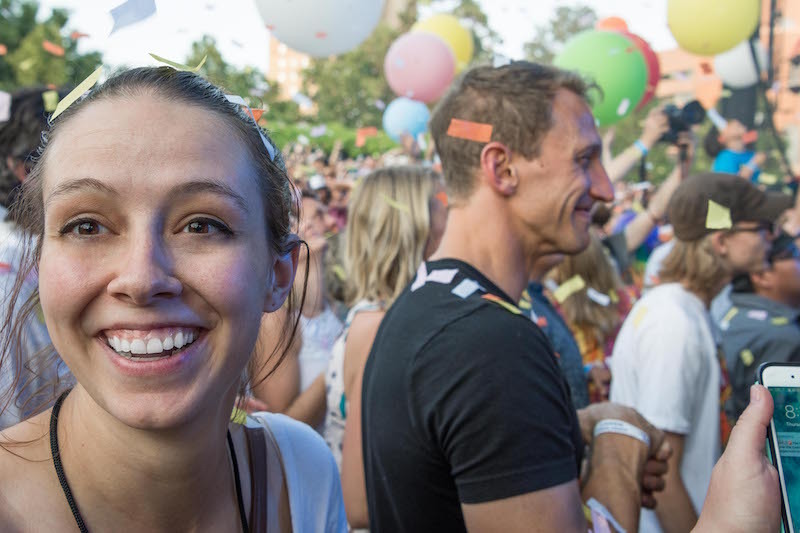 As part of the tickets for Twilight, a Frontrunner pass was included so many concert goers were using the rail system to travel from all over the state. 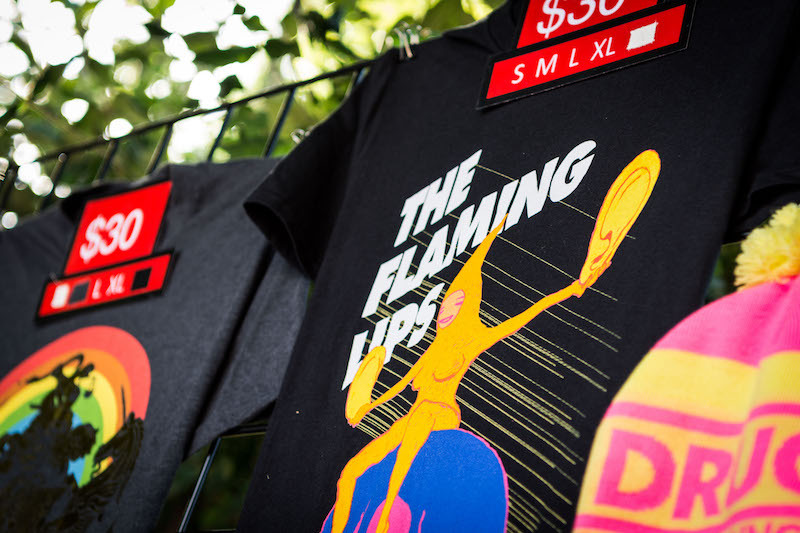 Upon entering the amphitheater, we made a beeline to the ATM, as many of the vendors were cash only. 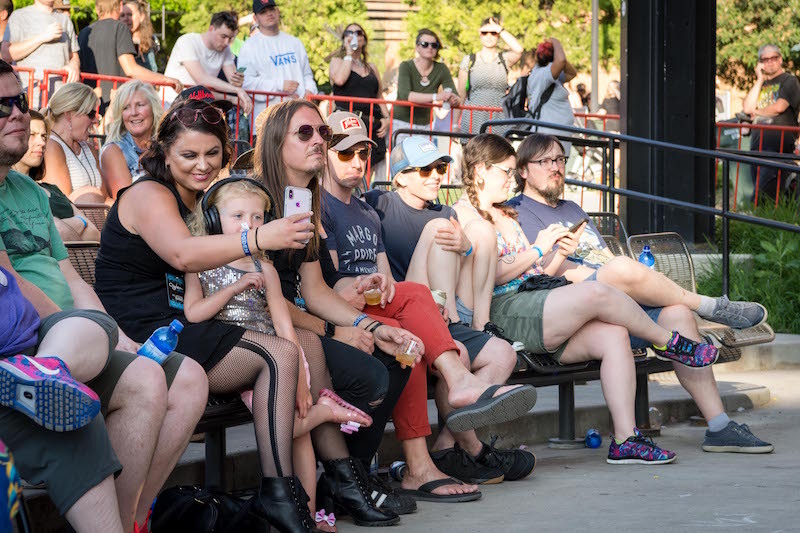 For pizza, snow cones and beer, the lines were long but joyful as people enjoyed the beautiful day, bathing in the upbeat ambience created by good music. 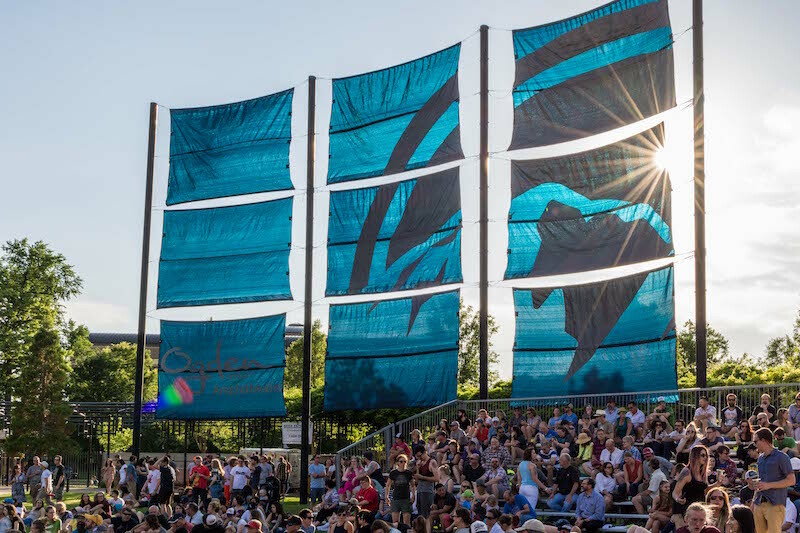 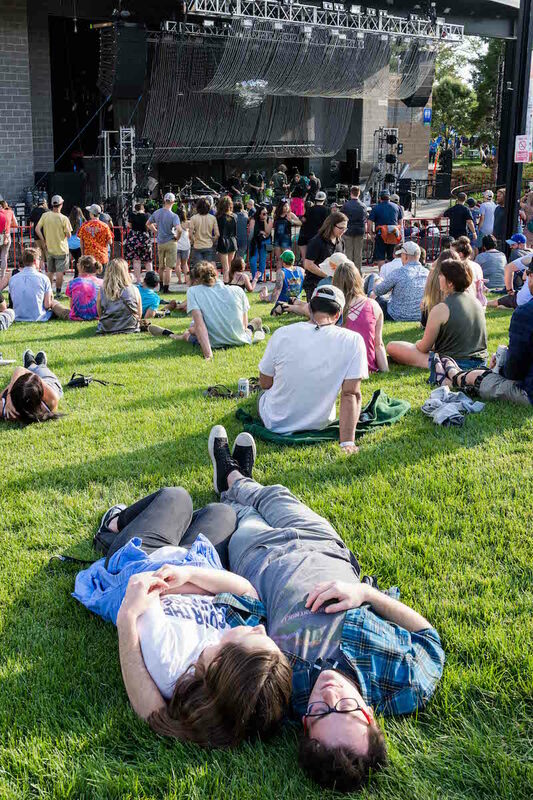 During the opening music, people lounged on the grass, the bleachers, and the VIP seating area. 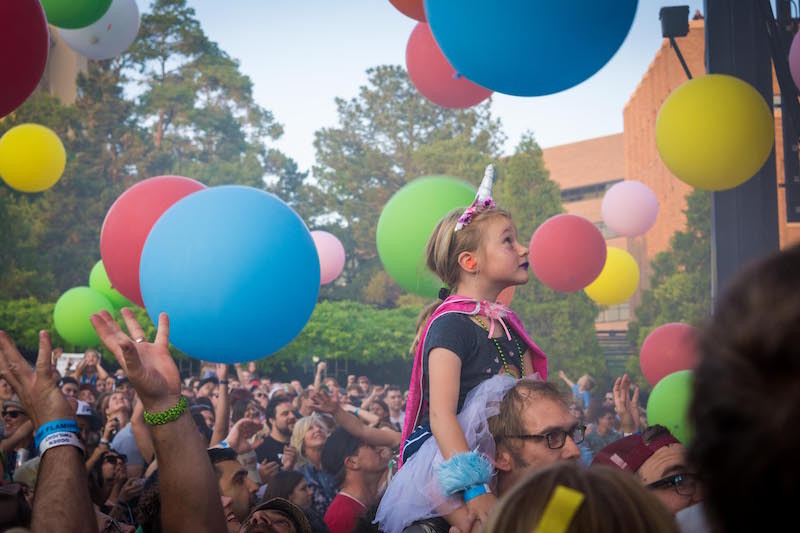 Fans were dressed in bright T-shirts and makeup, some even wearing unicorn horns and gems. 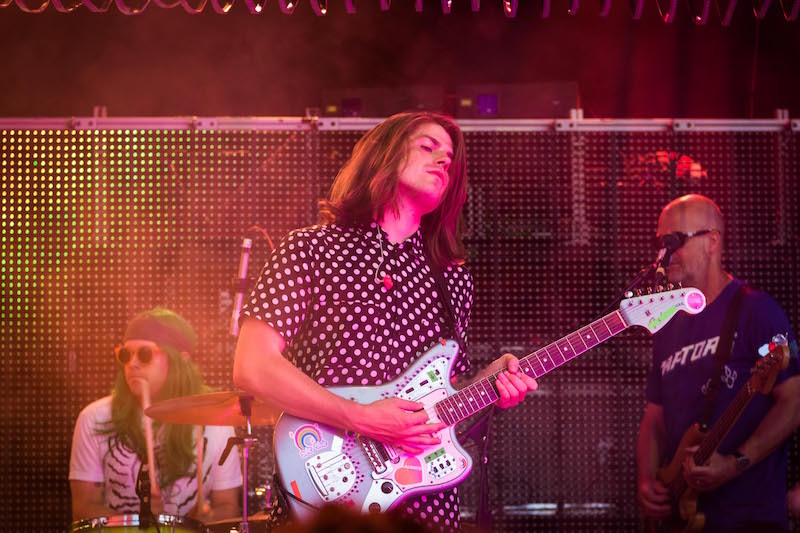 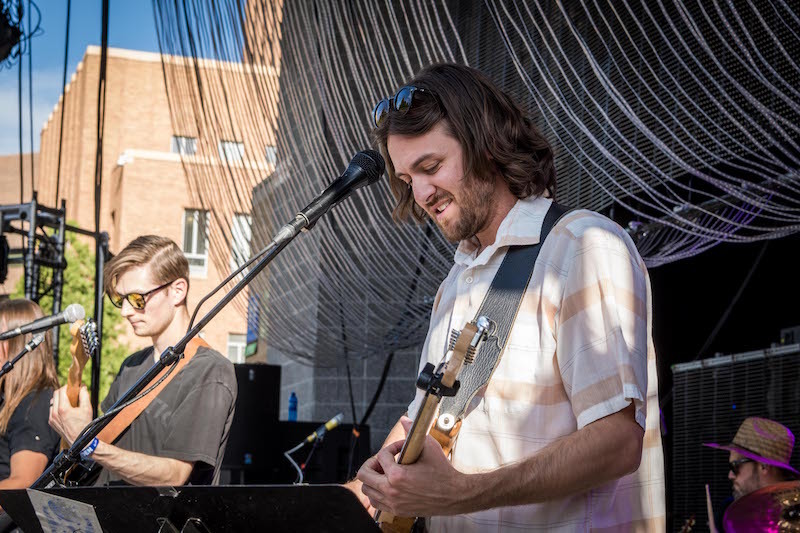 Night Marcher, pulling inspiration from the ancient ghostly warriors of Hawaii, performed their psychedelic, soul music as the local opener. 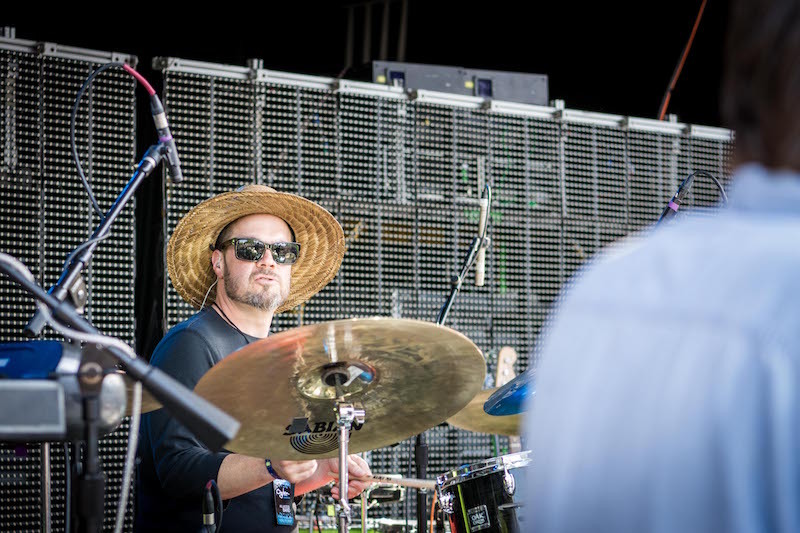 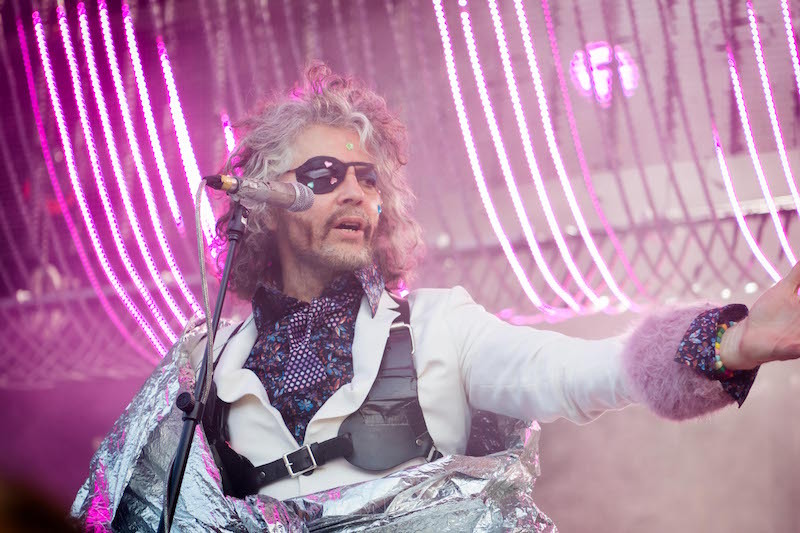 B|_ank, a longtime collaborator with the Flaming Lips and the passion project of William Passionfruit Hicks, beat the drums in a methodical, electronic performance. 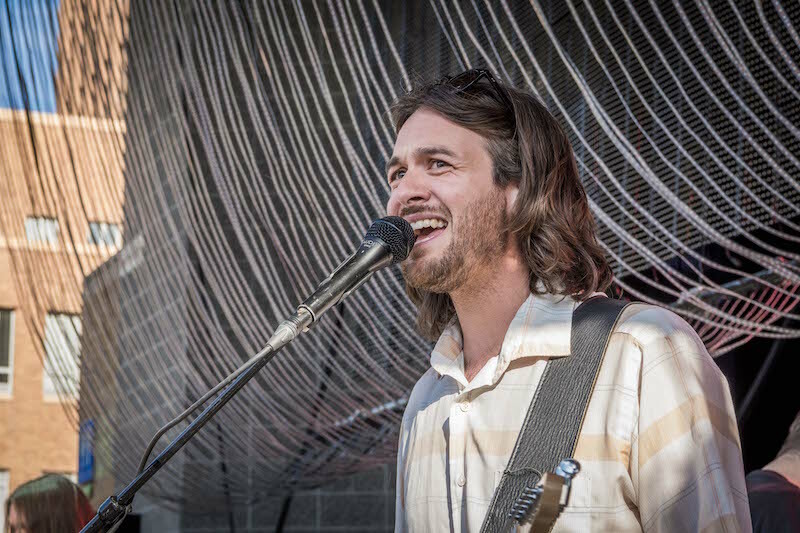 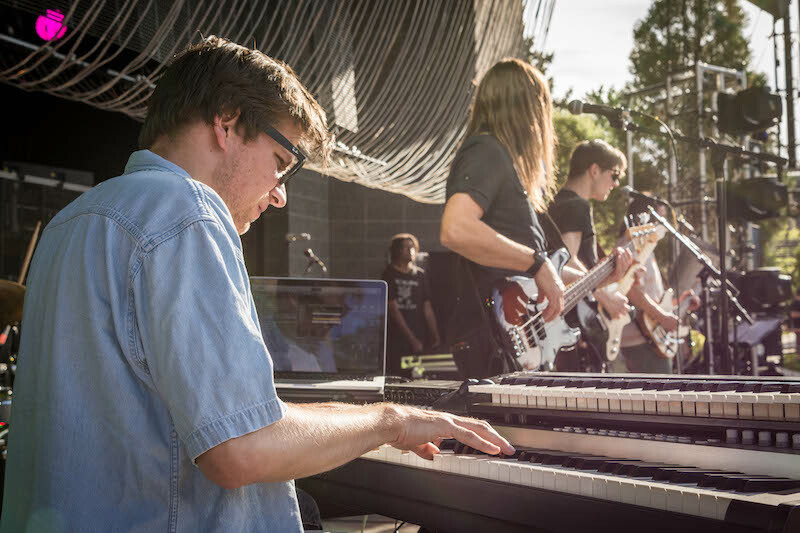 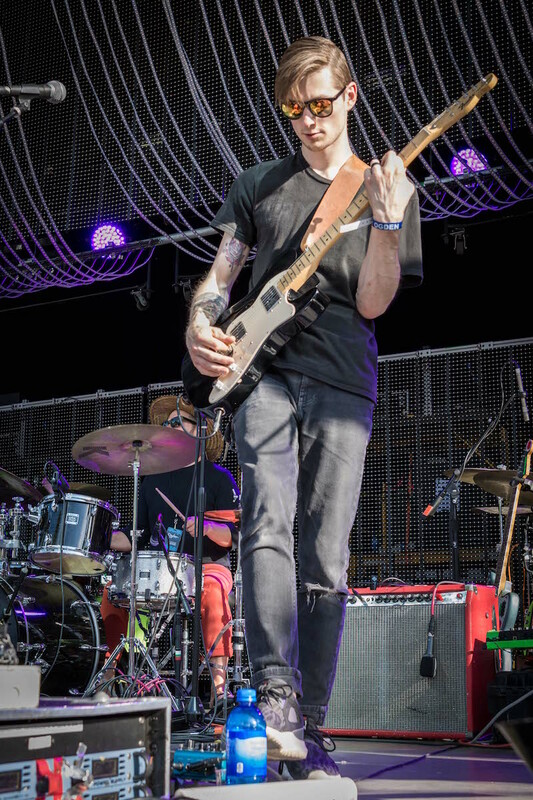 His experimental music kept the crowd engaged as they basked in the June summer sun. 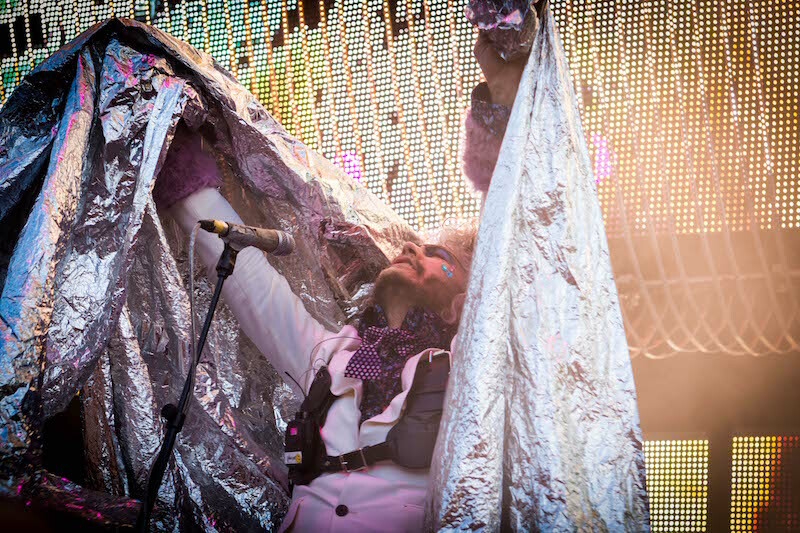 As the sun lowered in the sky, the stage emptied as the crews prepped for the Flaming Lips performance. 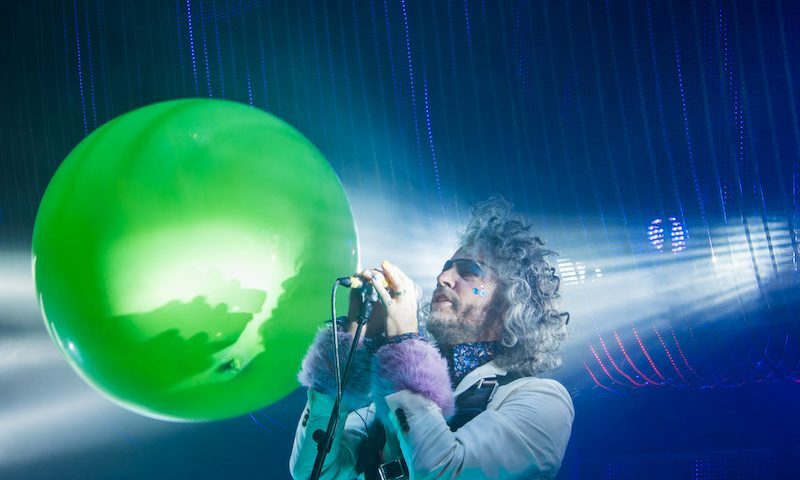 Tinfoil-looking instruments and bright, deflated objects were brought onstage. 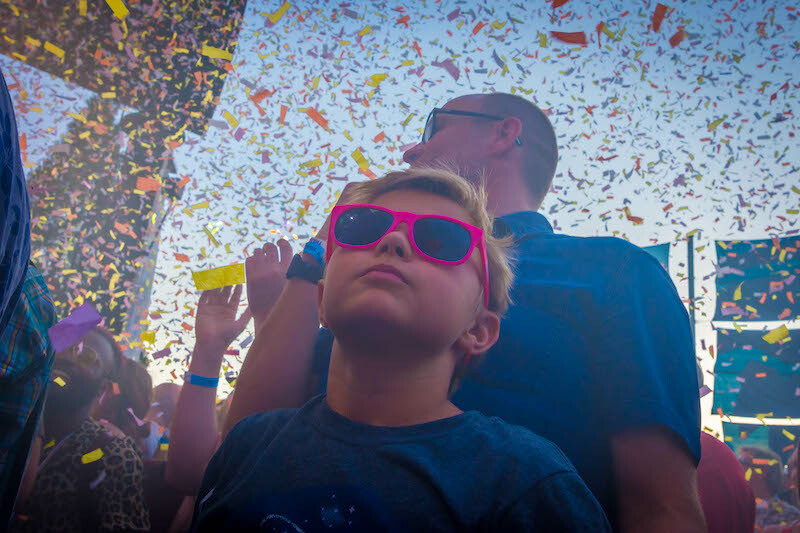 A kid robot opened the show with a brief introduction of Ogden Twilight’s sponsors and supporters. 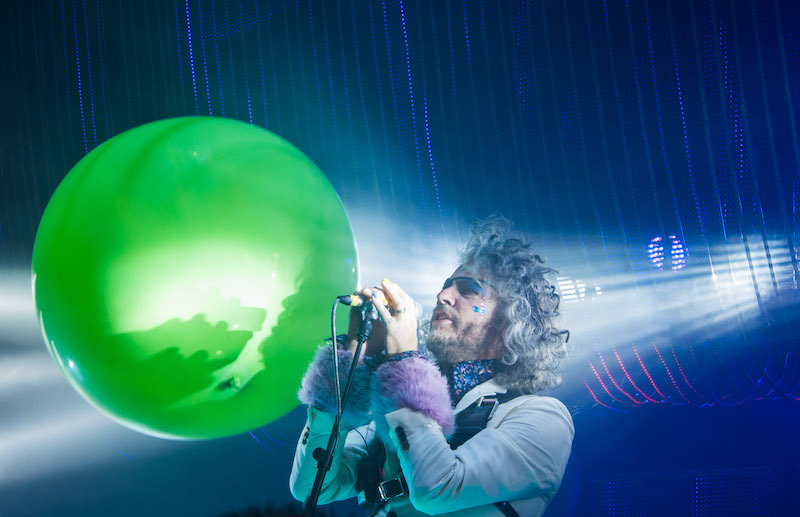 Those seated in the crowd rose to their feet as a member of The Flaming Lips began to come onstage. 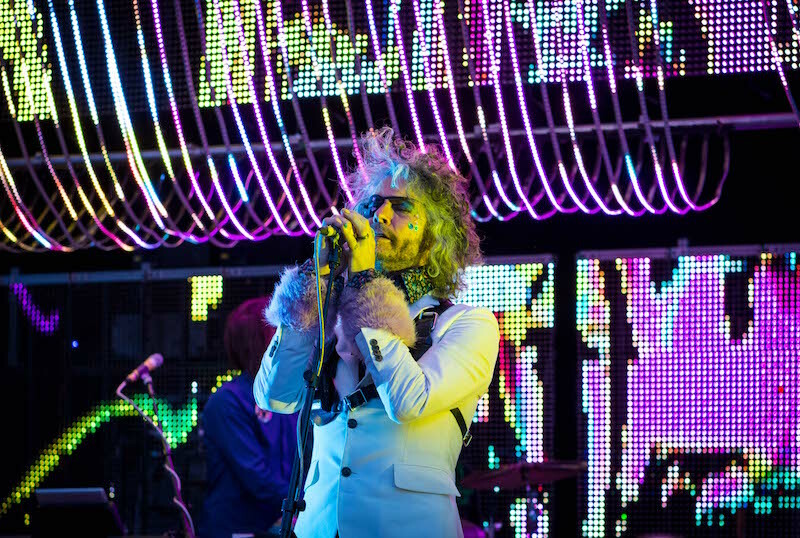 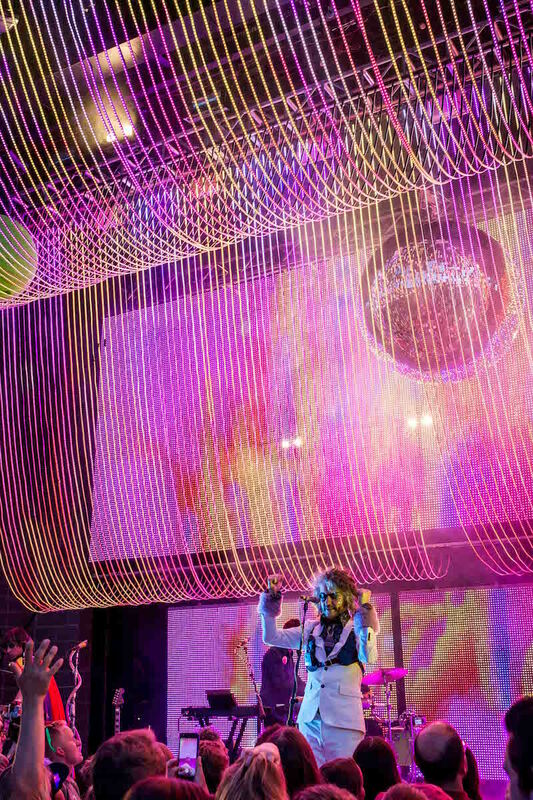 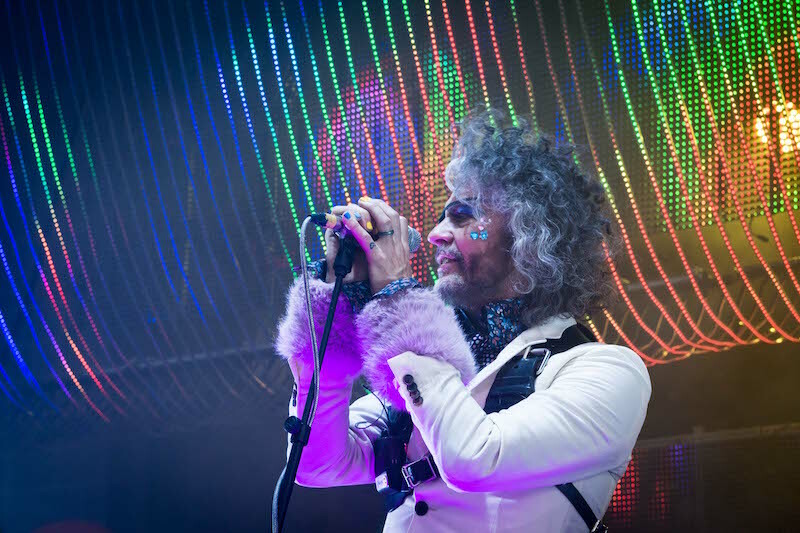 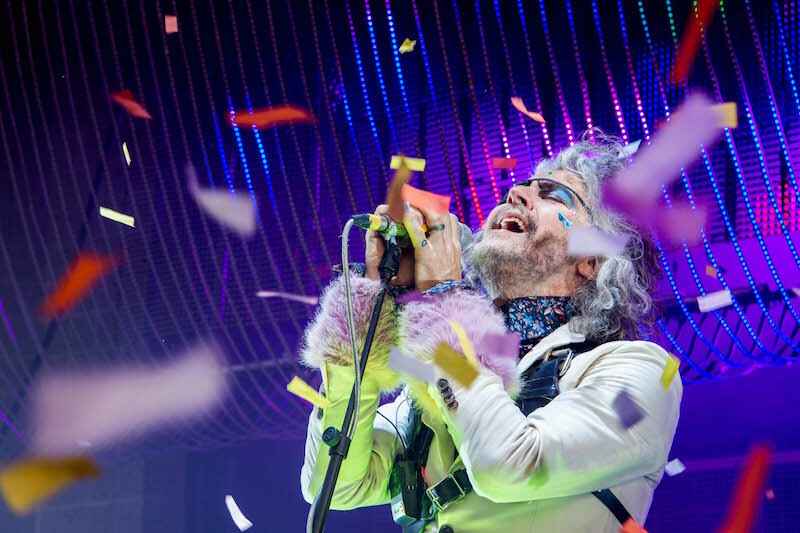 The final member of the band, Wayne Coyne, appeared centerstage in a bright white suit, with glittery gems bedazzling his face. 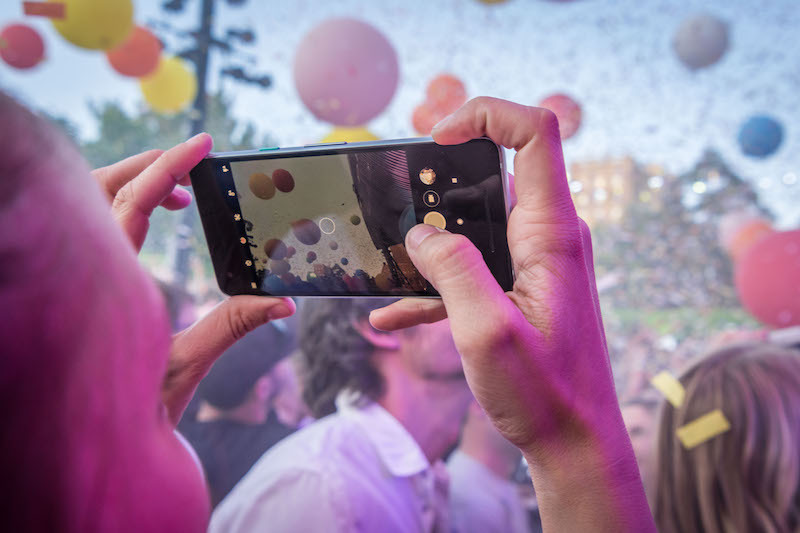 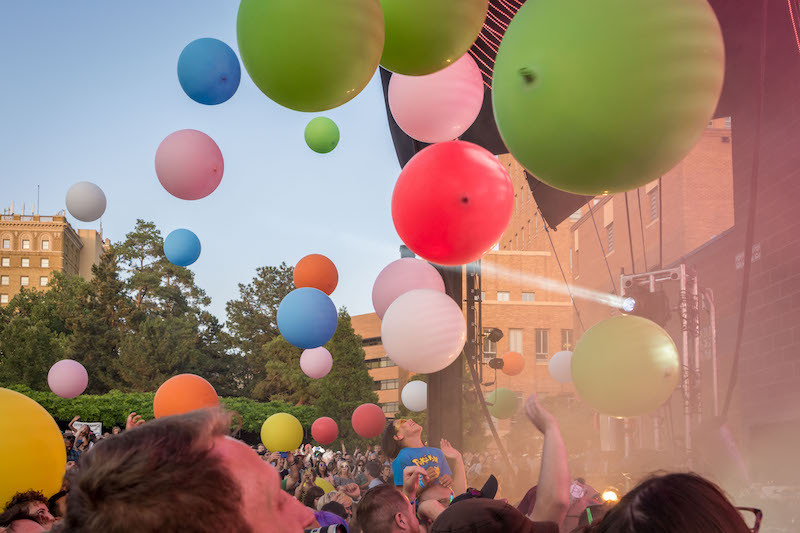 As the first song began, giant balloons and confetti fell from the sky, which created a magical childlike fun. 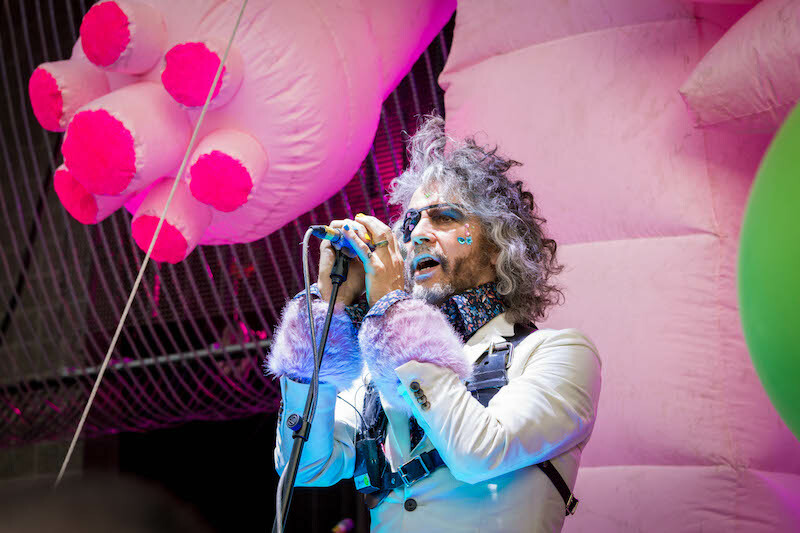 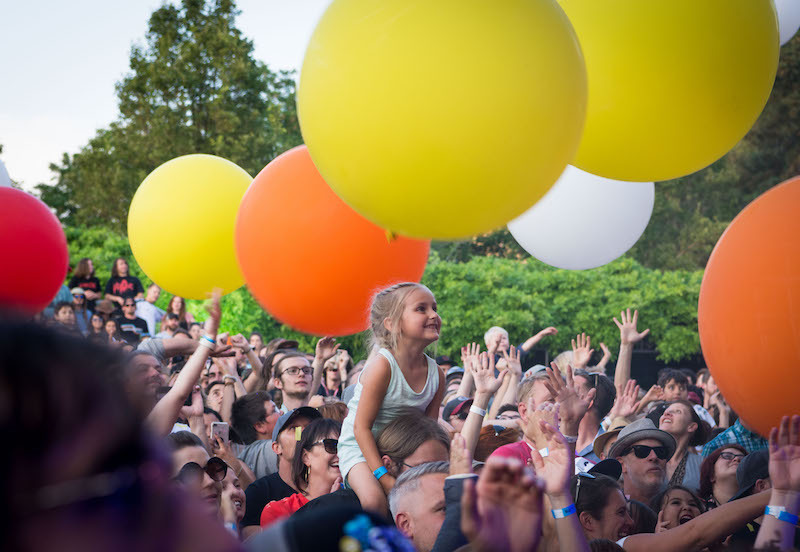 Adults and kids alike smiled and laughed as The Flaming Lips performed their first song. 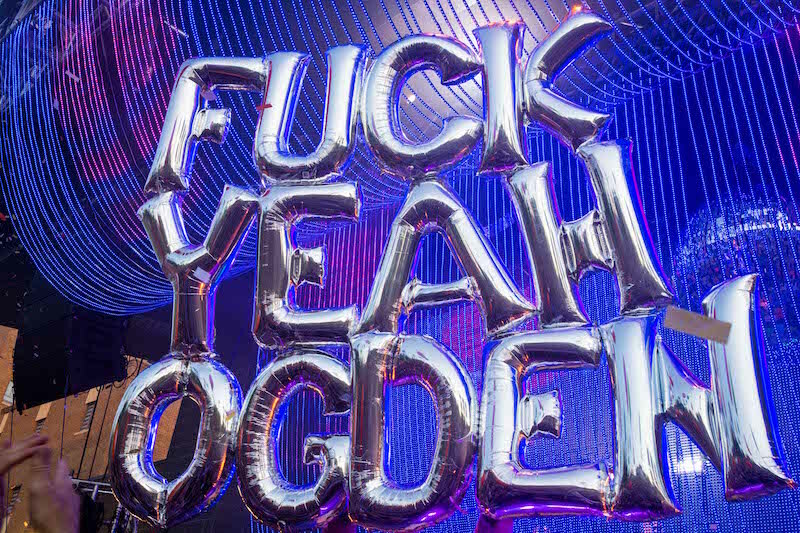 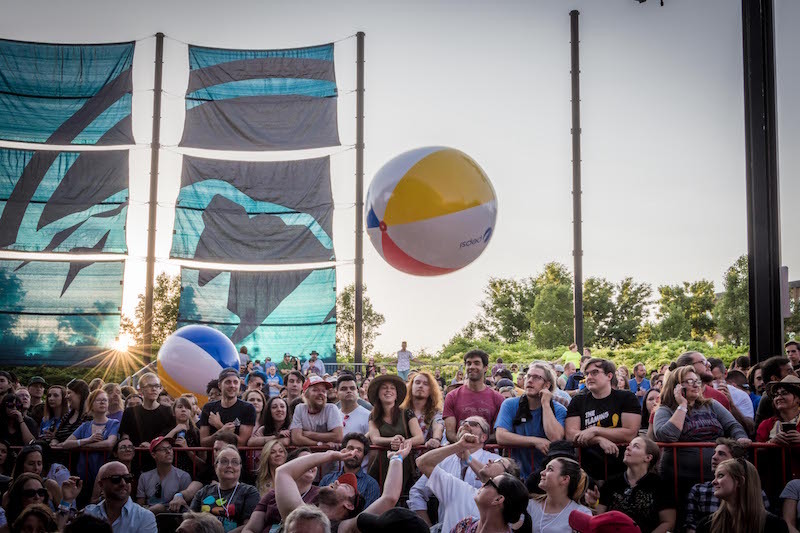 Coyne brought a giant series of custom balloons, reading “F*ck Yeah Ogden,” that he sent off into the crowd to be pulled apart and collected by fans. 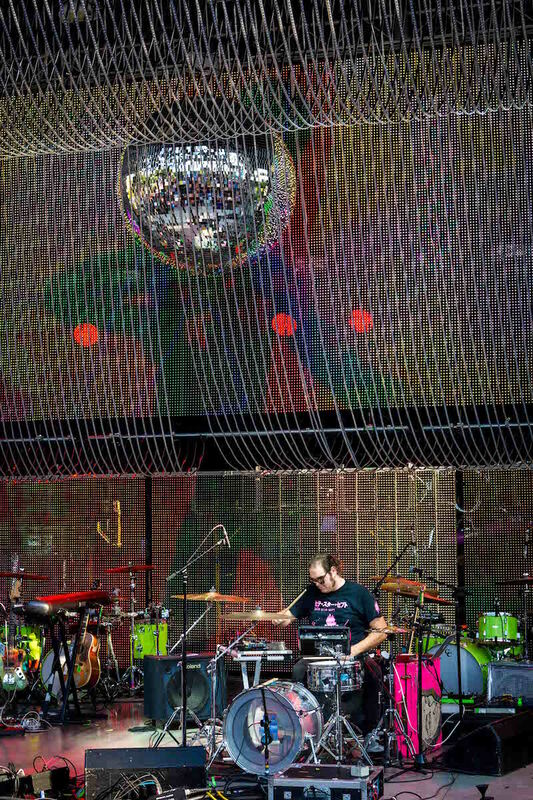 As the song came to an end, the crew began pumping up a giant pink blob that soon turned into the shape of a robot. 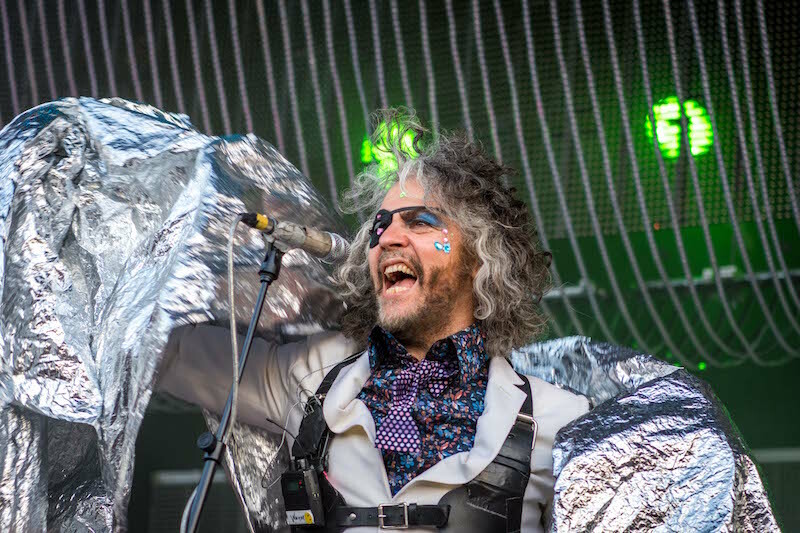 As the song “Yoshimi Battles the Pink Robots” began to play, Coyne asked the crowd to join in a vigorous karate chop at the beginning of the song. 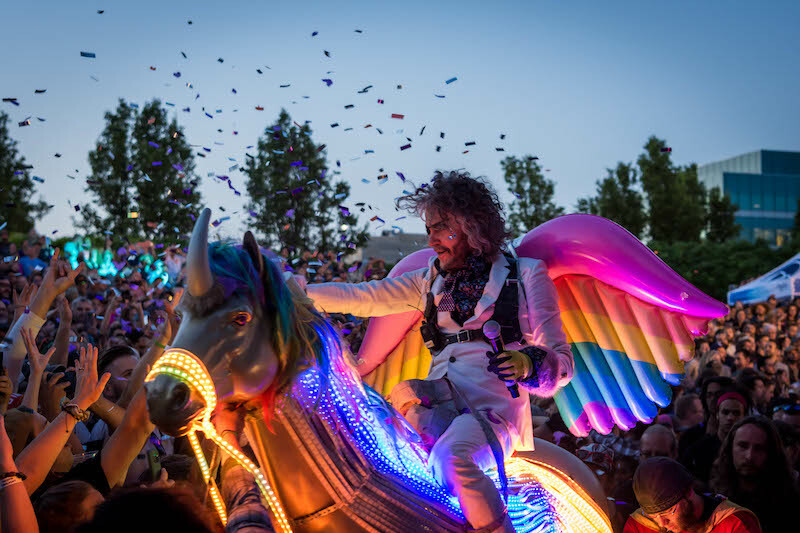 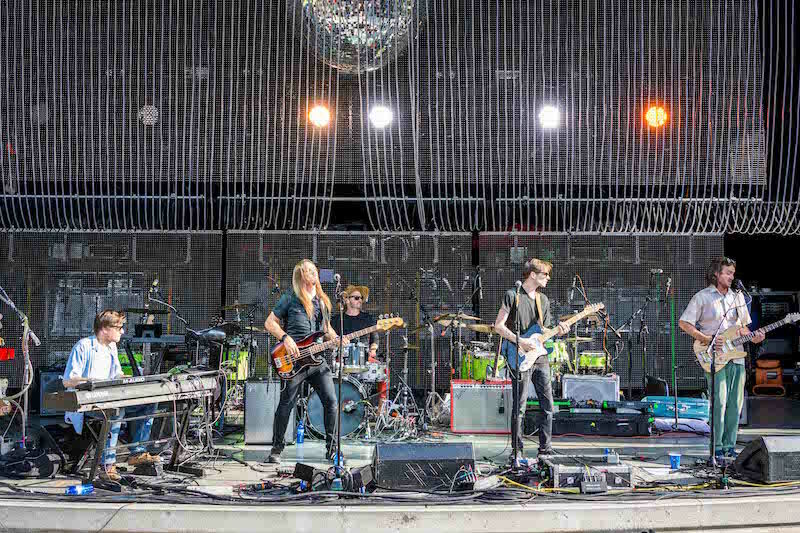 The evening continued much in this same way, with a childlike creativity and amusement seen in the giant unicorn that Coyne rode through the crowd while wearing a set of rainbow wings to the massive clear bubble that encased the lead singer as he bounced along the heads of the crowd. 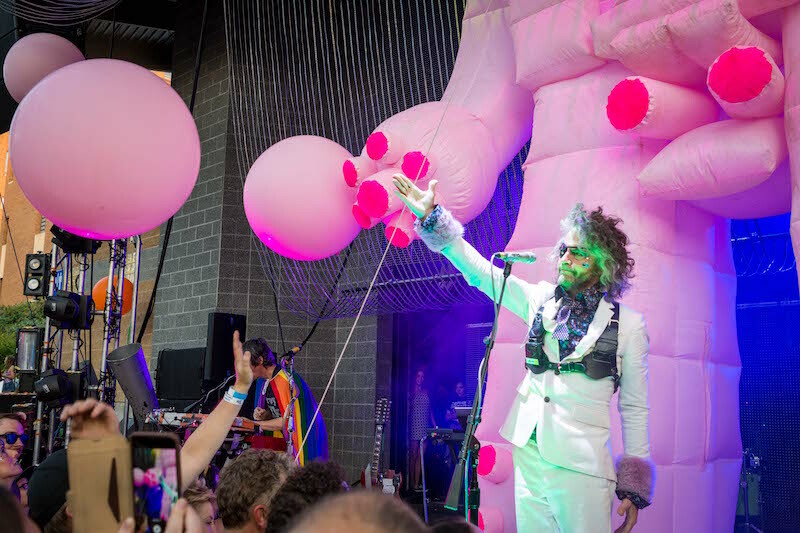 Reflecting on the show, it was one of the best, interactive performances given by any artist, making everyone in the amphitheater smiling broadly. 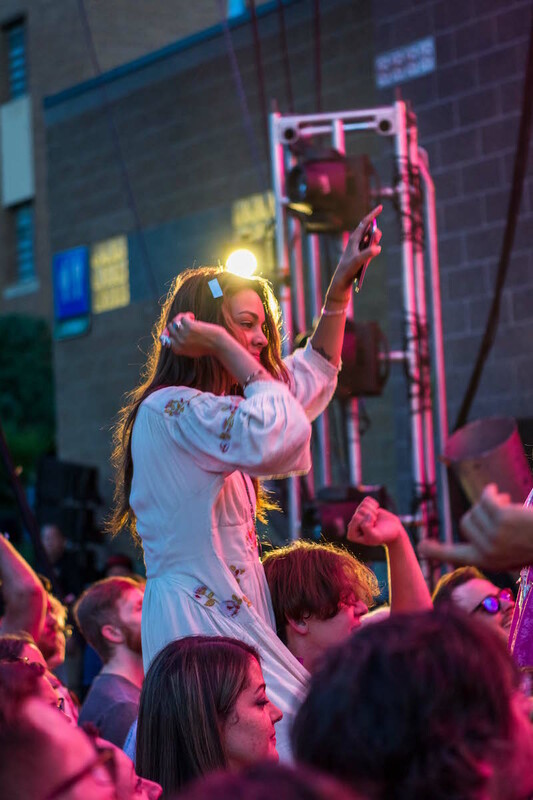 Ogden Twilight and all their supporters could not have picked a better band to set the stage for the rest of this summer’s shows.